Every January 1st is this blog’s birthday. And this week it’s 8 years old! I am so glad that I jumped in the waters all those years ago. It has been a gift to me in more ways than I can count, mainly the risk that’s been involved in saying out loud some of the things rattling around in my head (it’s a carnival in there) and connecting with so many amazing kindred spirits over the years. It hasn’t been without its costs. The critique, the assumptions, the mean words that are sometimes emailed to me haven’t been the easiest thing in the world for people-pleaser-me, but it’s been the exact thing that I need to practice in my life. Showing up, telling the truth, trusting God, letting go of the outcome. Not having it all sorted out. Not trying to make everyone on all sides happy. Not editing all the time to make sure that no one’s feathers are ruffled or that everyone understands exactly what I mean (or like it). I also have felt a bit more ambivalent about blogging since I returned from a 3 month break last summer. It really did help me not think in blog all the time, ha ha. What I have decided to do, at least for now, is just keep doing in some ways what I have always done–write when something comes, don’t when it doesn’t. My goal here has never been to develop something big or make something exciting happen but just have a space available and trust the right people always find it. I do wish sometimes I had more time to cultivate greater community here and on the Facebook page, but it just doesn’t work time-wise with the real-life realities of The Refuge community, my kids, and a lot of other things I’m always juggling. Thanks for understanding that. At the end of each year, I always like to look back on what was up around here and share a little roundup. 1. a thing or two about narcissism (+ church) – this post blew them all out of the water and became the #1 most viewed post of all time. I am really happy about that (and sad, too) but hope that more and more people begin to recognize the ravages of narcissism in church leadership and break our addiction to charisma and inspiration. 2. friends-of-faith-shifters: things that help, things that hurt – Oh, faith shifting stuff can be so lonely, and there are some things that help and hurt that those who aren’t experiencing it can learn from. 3. Christianity’s faith shift – I think western Christianity is in it’s own crazy faith shift, and some the same rhythms from the book that we can apply personally work here, too. 4. 5 popular ways to shut down conversations about power – It’s fascinating how easy these roll of the tip of our tongues in so many conversations about power. 5. church bingo: before and after our faith unravels – Just because I thought it was fun. 6. important words from parents of LGBQT kids: what hurts, what helps – I loved spending a few days in an amazing online support group for moms of LGBQT kids. They have a lot of wisdom we can learn from. 7. post-traumatic church syndrome is Real (and worthy of a capital letter) – So many are suffering from post-traumatic church syndrome (pick up my friend Reba Riley’s memoir if you haven’t yet). 8. leaving church to save our souls – There’s so much misconception about those who are “done” with church. I always say to not confuse “dones” with “don’t cares” and sometimes it’s true, leaving is what we need to do to save our souls. 9. when our christian faith is questioned – When our faith shifts and we don’t use the same language anymore, believe the same things, or play the same way, sometimes people can question our christian faith. It stinks. 10. “but God says…” – I did a 3 part series on phrases that really bug me. I guess I wasn’t the only one :). ex-good-christian-women – It’s still one of my favorite phrases and love seeing women break free from all the baggage of what it means to be “good” as a christian woman. It’s a travesty, the things so many of us were taught. Small is Plenty – The emphasis on “big” and “wow” and “successful” has really done a number on so many of our heads when it comes to our dreams, passions, and ordinary lives. Small is plenty. second place was one of my biggest “gulp” moments ever in blogging–about pictures of me online in a bathing suit surfing behind our boat–One of the Bravest Things I’ve Ever Done. The Work of the People Videos about Faith Shift – These videos originally came out right after Faith Shift released in October of 2015, but last fall, they released the videos as a bundle, along with a 6 part discussion guide to download so that pockets of people and small groups can process the material together. If you use them, let me know! The Jesus-Centered Bible – I was honored to be part of this project and wrote the introductions to 4 books–Isaiah, Lamentations, Luke, and Colossians. My favorite part of this Bible is that all of the verses that point to Jesus in the Old Testament are in blue, and the red extends beyond just the words of Jesus but any reference to Jesus in the New Testament. Failure week, for real this time – I never got around to posting this in 2015, but I’ve got 5 posts coming. Failure!, Failed Relationships, Failed Faith, Failed Parenting, Formation Friday: Fear of Failure. Yeah, I’m a real upper for the new year. Rebuilding – I have meant to do this for a while, but I really want to walk through some thoughts on rebuilding from Faith Shift, maybe in video blog format, maybe in writing, who knows. But I am saying it out loud here because that means I will actually do it, so stay tuned. 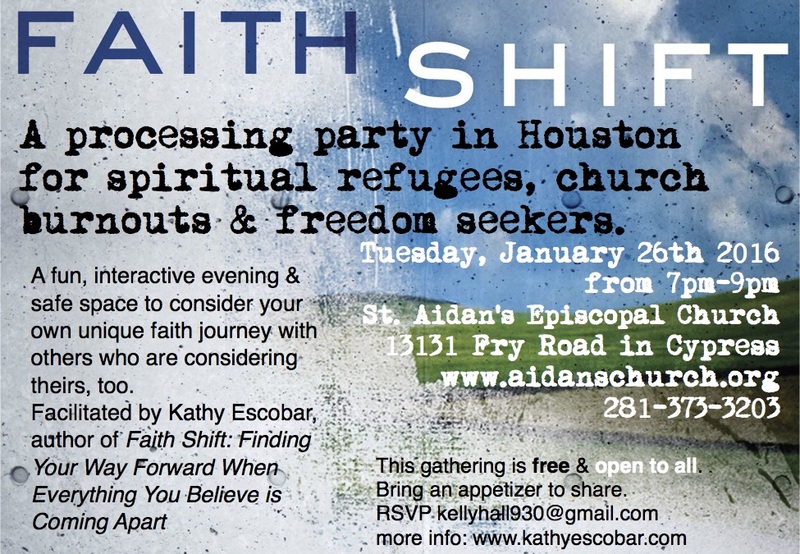 Faith Shift Processing Party Online – I just have to spend some time to figure out the format, but we taped Denver and I will spend in the next few weeks I will work on what a closed group might look like for that so that others can participate. Meanwhile, if you are in Houston and want to come play in real life, I’ll be there at the end of January. Again, thanks for reading. I love hearing your stories and what things get stirred up around here and how you’re clogging & slogging & scooching, too. It helps me more than you know. ← pushing, pulling, letting go. Congratulations on hanging in there for eight years Kathy. Many of us appreciate and benefit from your writing and from knowing you. Many of the people I know who once had a blog gave up on blogging. Regularly having something to say can become a daunting task. Then there are the angry, disturbed people who try to vent on our blogs. Christian blogs sometimes attract more than their fair share of those people. That’s why we have a delete button. We’re not deleting them. We are merely choosing not to share their obnoxious comments with the world. Even though we try, it is often difficult to see the person who hides behind mean, angry words. I am looking forward to what you have to share in the upcoming year. Thank you for loving those who are not always lovely, and thank you for being a friend. thanks my friend. i am so grateful to know you and for me is a great example of why i am so thankful. i would have never met you otherwise 🙂 appreciate your passion and heart so much. it gives me hope. Congratulations on your blog birthday! I really wished I had stumbled on your blog eight years ago – that was when my unravelling happened. Hehe. But hey, better late than never. I get to benefit from eight years of your posts. Your post about narcissism in church is my favourite, by the way. I just left a church where there’s a heavy celebrity pastor atmosphere and it was driving me crazy, but I wasn’t sure why. Your post described what I felt. i am so glad you found your way here (how did that happen, btw?) peace to you as you keep traveling this road. you’re not alone! Thanks for replying! I think I found you because of Reba Riley’s book, Post Traumatic Church Syndrome. She mentioned you, and I looked you up, went through your blog and found myself nodding like crazy … and bought your book 🙂 Your book is so important to people who are out of the church, either from spiritual abuse or because of painful faith shifts. I’m now in the Rebuilding stage, and the book is still useful as it helped clarified the journey for me. 🙂 I thought it’d be really cool to tell my story – as you often encourage – so that I can help others see that this is normal, this is okay, and it’s necessary. What made me LOL was one of your posts which mentioned that one of the symptoms of a faith shift (I think) is that you start to swear. Boy, did I. And I never stopped. LOL.